Hiroshima International Animation Festival is a biennial manifestation held in Hiroshima City in August, endorsed by Association Internationale du Film d'Animation (ASIFA). Under the spirit of LOVE & PEACE, the festival has been dedicating to the advancement of visual media art culture in general, by promoting international cross-cultural exchanges through the development of animation art. Together with those festivals held in Annecy, Ottawa and Zagreb, the Hiroshima Festival is considered as one of the most respected animation festivals in the world. Hiroshima International Animation Festival was established in 1985, as a project commemorating the 40th anniversary of the atomic bombing. From the beginning, Hiroshima City and ASIFA shared a same idea, that is, to promote the international mutual understanding and to pursue eternal world peace through the development of animation art, which is a medium common to all human beings beyond nations and languages. 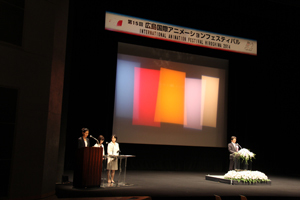 The creation of this festival was largely due to the earnest efforts of the two animation filmmakers --- Renzo Kinoshita, who at that time was serving as a Board Member of ASIFA and the President of ASIFA-Japan, and Sayoko Kinoshita, who was serving as the General Secretary of ASIFA-Japan. Sayoko has been the festival director since the first edition, dedicating herself to lay foundation of this festival until today, and is now also the Vice-President of ASIFA and President of ASIFA-Japan. Hiroshima Festival is a comprehensive animation festival, featuring competition programs to choose the Grand Prix, Hiroshima Prize and other prizes out of many latest animation shorts submitted from around the world. The festival also offers many special programs including retrospectives of masters and talented filmmakers, feature animations, high quality student works, animations for peace, for children, as well as seminars, symposiums, workshops, exhibitions, and educational film market, etc. With its outstanding international programs and administration, the festival is highly recognized not only within animation field but also throughout the media art society. On the occasion of the fourteenth edition HIROSHIMA 2014, the competition attracted 2,217 entries from 74 countries and regions, and 32,011 people participated during the five days of the festival. Hiroshima Festival continues to contribute ceaselessly as a festival respecting animation filmmakers in the first place, and also to serve as a gateway to success for world-class professionals. Our International Selection Committee will choose competition titles by previewing all entries submitted from around the world. Competition will be held during the festival, and our International Jury Members will decide Grand Prize, Hiroshima Prize, Debut Prize, Renzo Kinoshita Prize, Audience Prize and other prizes, which will be announced and presented on the final day. Especially, the Audience Prize will be chosen by votes of audience. In this program, internationally renowned animation masters and young promising animators will be competing each others equally, and audience will enjoy their high quality works with competition directors attending from all over the world. Retrospective of various animation fimmakers as well as many other special programs such as "Best of the World", "Stars of Students", "Animation for Peace", "Animation for Children", etc., will be shown. 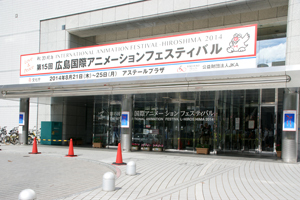 Also, exhibitions of artworks related to animation will be held. We will be providing various free spaces for participants to screen their works, make presentations, exchange ideas, etc. For example, "Frame In" for animation students, and "Nexus Point" for animation professionals. You are welcome to apply for a space on the festival first day and after. Please bring your own work and participate. The unique film market providing bridges between schools, students and productions. Japanese Universities and colleges, which have animation major, will be participating to introduce themselves and their student' s work. Also, it has a previewing corner where audience can appreciate student works from all over the world.